I've heard loads of great stuff about this new and upcoming author N.K.Jemisin, and it's a refreshing change to see a fantasy novel that is multi cultural. The main character, Yeine Darr, is mixed race which is not something you see much of in the fantasy genre, and I also like to read novels centred around a strong female character. I decided to give this book a read as I love being absorbed into different worlds and this book looked highly original and inventive. The book has a really modern feel, the author has been really clever in mixing modern day issues into a fantasy novel. The Hundred Thousand Kingdoms is centred around a young girl, half barbarian, half Amareri who after the sudden mysterious death of her mother finds herself named as an heir to the Hundred Thousand Kingdoms. This puts her in grave danger and her only friends are a strange bunch of enslaved gods who are even more dangerous than her foes. The story is very original, it's very intelligent writing, sometimes I felt the novel in places was at risk of appearing far fetched and unrealistic with the gods being so real and approachable to mortal beings, it's a very difficult concept to add in a book. However N.K.Jemisin does it very well and the characters do seem plausible. I'd recommend this book, it's refreshing to read great fantasy and alternative novels from a female perspective. 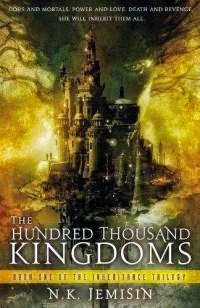 This is a great debut and if you love the book you'll be happy to know that The Hundred Thousand Kingdoms is just the first instalment of a trilogy, and its sequel - The Broken Kingdoms is already out.